A rare giant crab has died in the National Aquarium in Galway just days after it caught off the coast of Mayo. 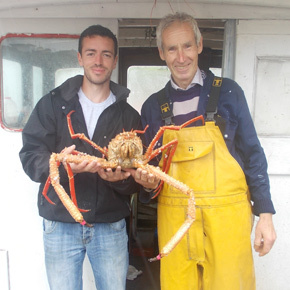 The large box crab, which measured 43 inches from claw to claw, was hauled by fisherman Michael O’Toole last week in 70 meters of water a mile off the coast of Innisboffin, reports the Mayo News. The crab was then taken to the National Aquarium in Salthill in Galway where it later died. Kevin O’Hara, Manager of the National Aquarium said that the stress of being removed form its natural habitat may have killed the sea creature. O’Toole, the fisherman who made the catch, was disappointed to hear about the crabs death. “I have been fishing for over 40 years and I never seen anything like it before in my life,” he told The Mayo News.